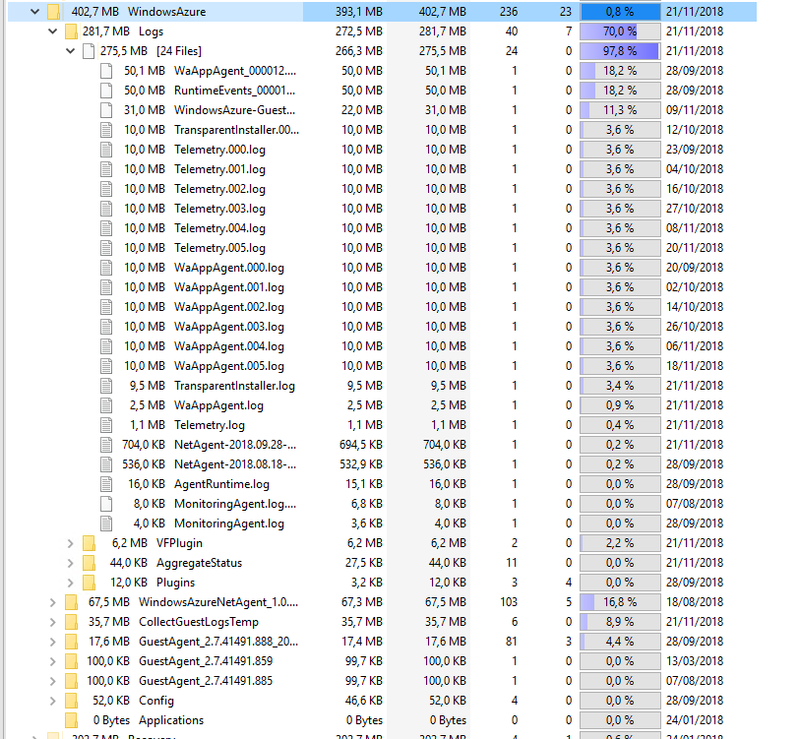 > Azure, Windows > Azure Agent – Where did my space go? Azure Agent – Where did my space go? Recently I had a weird case where one of our Azure servers was starting losing space pretty quickly making Pulseway go nuts. As you can assume from the title of this post the cause for this is Azure Agent itself. 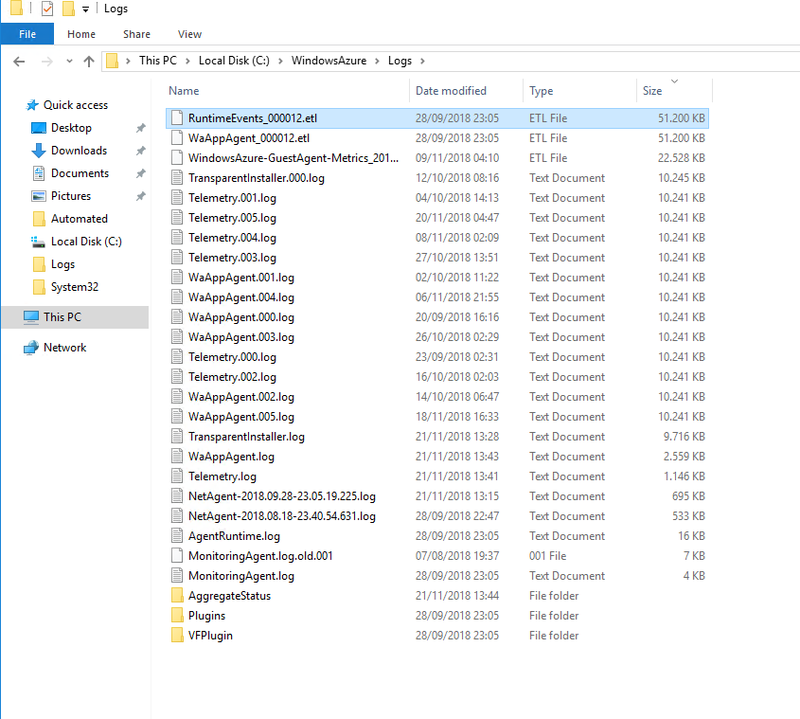 But before I actually knew that I had to do some digging as it's not that obvious because Windows Explorer isn't showing anything worth checking. How do you check what's taking space? You use tools like TreeSize. I'm sure there are other tools on the market but actually, only TreeSize never failed me. Excuse the mess, it's not supposed to be like that, but I am not the one carrying for it. 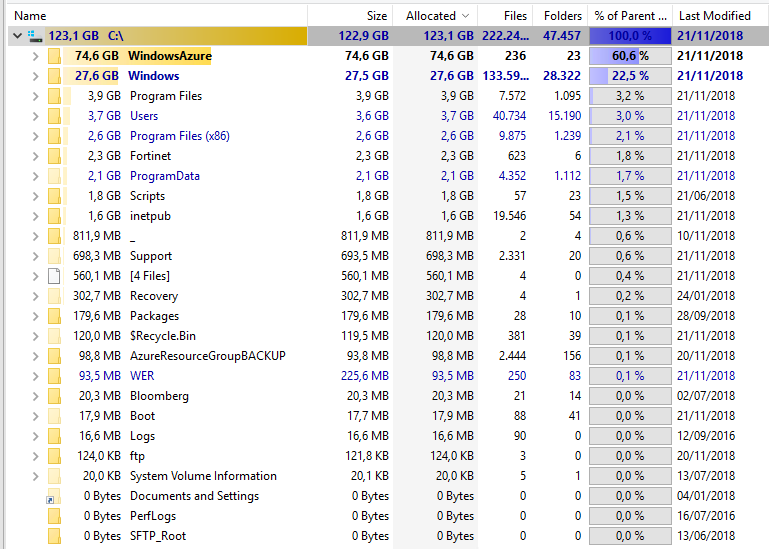 As you can see above, there is 74GB taken by WindowsAzure folder, and what Windows Explorer has to say about this? 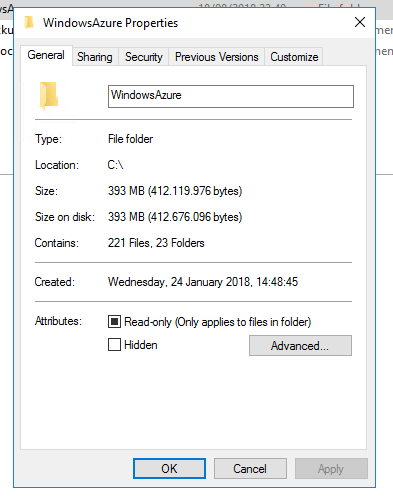 Only 393MB shown by Windows Explorer. The trick here is if you drill down into that folder even TreeSize will stop reporting large size. Since I knew ETL (Event Trace Log) is a bit special files I was suspecting that one of those 50MB files with ETL extension is actually taking all the space by itself. The fix is quite simple. Delete the offending file and be done with it. But even with correct permissions, you're not able to delete this file because this file is in use. So I just had to find which service is responsible for my misery. None of the usual suspects panned out. Restarting this service instantly removes 70 GB of data. Problem solved but why is RdAgent actually taking all the space with its mysterious ETL file? What it's trying to trace?